Professor Keith Laybourn, with Professor David Taylor, examine the coming of the car – what it meant for British society and in particular how it was policed. 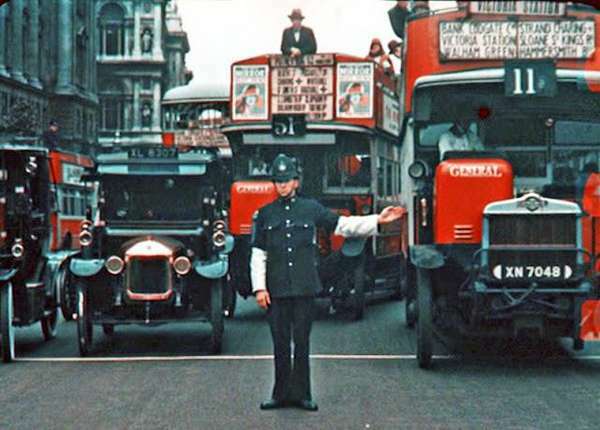 The coming of the car led to a battle for Britain's roads - motorists versus pedestrians, with the police in a vital peacekeeping role. It was a battle that would lead to segregation, as pedestrians lost their ancient rights of saunter on the highways. It would transform childhood, with youngsters forced off the streets into the home. It would bring about a revolution in policing, with officers swapping the beat for patrol cars. Now, the University of Huddersfield's Professor Keith Laybourn has brought together many strands of a saga that began with early motorists forced to be preceded by a man on foot waving a red flag. Regulations were relaxed and speed limits increased, but rising numbers of cars on the roads led to carnage, which politicians dubbed a "holocaust". Police, although initially reluctant, were forced to take on greater and greater responsibilities and they adopted increasingly sophisticated tactics and technology. Professor Laybourn's latest book is The Battle for the Roads of Britain and it covers the 1890s to the 1970s. "The main theme is that the car fundamentally changed not just life and society, but also policing," he says. Well-known as a historian of the Labour movement, Professor Laybourn has also turned his attention to wider social issues. His previous book - co-authored with Professor David Taylor - was Policing in England and Wales, 1918-1939. When researching and writing The Battle for the Roads of Britain, he continually found that there were new avenues to explore and the book is therefore one of the most comprehensive analyses of the subject to have appeared so far. It covers a vast range of topics, including early speed traps, the role of the AA and RAC, the use of disguised Q cars, the development of traffic lights, CCTV and the breathalyser - and prejudice against women drivers. In 1938, one writer alleged that "aggressive women take a fiendish delight in weaving in and out of the traffic frightening poor male drivers by their recklessness and verve. Many a woman takes out her hate of her husband or her sexual dissatisfaction, in reckless driving". "Before the car emerged, people had the right of access to the road - the automatic right of saunter," said Professor Laybourn. "If you went to a town in 1900, you would just walk across the road. You almost wouldn't look. Fifteen years later, that was a very dangerous activity!" By 1930, there were some two million vehicles on Britain's roads and 7,000 deaths in traffic accidents. It was described as a "Road Holocaust" and led to a change in attitudes and strategy by the police, who became omnipresent if not omnipotent, as traffic patrolling, point duty and road safety was developed. They were summarised as the three Es - "Enforcement, Engineering and Education". These would have the desired effect. By 2014, with 35 million vehicles, there were 1,713 road deaths. In the conclusion of his book, Professor Laybourn states: "The battle for Britain's roads in the early and mid-twentieth century was an unequal conflict between the motorist, the pedestrian and other road users, mediated by the police. Given the remorseless indomitable and unforgiving nature of motorised vehicles, it was the motorist who won the road." A major theme of Professor Laybourn's book is the response of the police. In contrast to some historians, he does not believe that they were in thrall to the motoring lobby. Instead "the police sought to steer a path - serpentine as it may have been - through the minefield of traffic policing in a new urban landscape". The Battle for the Roads of Britain, by Keith Laybourn with David Taylor, is published by Palgrave Macmillan.